This a list of details for traders that are registered with this site. Jurassic Tools here:-- https://www.jurassictools.com/ Selling small Engineering tools to Modelmakers and Engineers alike. Drills, taps, spindle tooling, Carbide inserts, Collets, milling and turning tools, carbide and HSS cutters and lots more, take a look. Several thousand items available. Hope you find something of interest. I am the grim reaper I will clear your home workshop for cash ,sweep up on the way out,after drinking your tea. Always wanted, Myford ML7 & Super 7, ML10 Lathes.Other small lathes and milling machines wanted The good, the bad or the ugly. Read more for contact details. 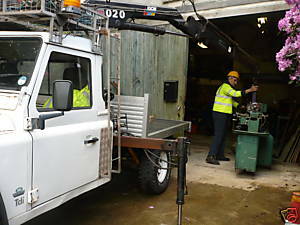 Now using flatbed Transit with rear mounted crane, ideal for narrow drives etc. Competitive rates, careful, reliable, fully insured service. Small amount of dry secure short term storage. Machinery bought and sold from a single item to a complete workshop. We also make other things in Wood or other materials, replacement Barge Boards for building restoration and the famous ‘Jag Mate’ tool shelf to name but two. Simply put, if you need something created by cutting it out flat material with utter accuracy, we might be the best option. A visit to our website will give much more information. alloys using the lost wax process, ideal for the model engineer and restorer.